Our Latest Design Is Here. Introducing the hottest design this year- The PBi11 2.0. The PBi 11 2.0 has all the same classic features the original had, we tweaked them to better fit your needs. 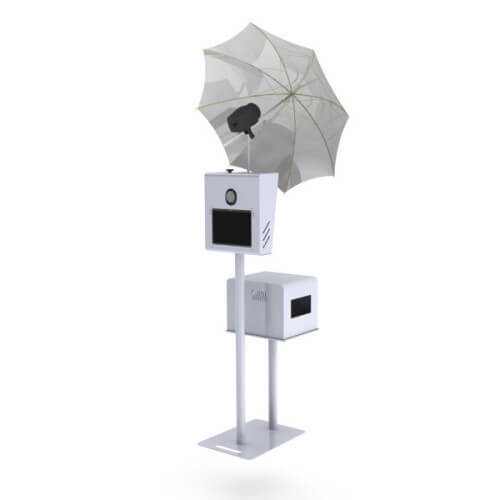 The PBi 11 is known for being the small compact “celebrity” Photo booth. With all the same great features it now has the printer stand included on the same base, for a more compact booth. No more fingerprints!, The PBi has been redesigned with a matte finish opposed to the gloss finish which can be difficult to keep smudge-free. Finally, We have gotten rid of the adjustable pole that can cause unappealing scrapes and scratches and have instead made the camera shelf adjustable. The new model still breaks down into 6 pieces and fits into any car. The printer stand can also accommodate you favorite Photo Booth printer like the DS602a, RX1 + DS40. The PBi is as hot as ever and you need to get yours now!